He can laugh about it now. But two decades ago, antiques dealer Colin de Rouffignac had the opportunity to buy the complete collection of paintings by J Lawrence Isherwood. And who was offering this once-in-a-lifetime opportunity? Colin said that he first met Isherwood soon after opening his shop on Wigan Lane in 1976. 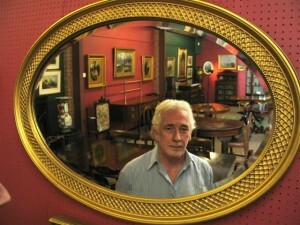 He recalled: “One day he came in with a little case and asked if I wanted to buy any paintings. I did and gave him £20 for three. I always liked his work. “When I knew him his mother had already died and he was something of a Bohemian figure…eccentric and scruffy but with a kind of faded elegance. He always wore a cravat and he looked every inch the artist, always a bit run down and it sometimes seemed to me that he’d his failure to readily sell his work had left him wrung out. The rejection must have been awful. “I knew he drank, but he was always sober when he brought his pictures to me and I built up quite a collection over the years. Perhaps once he had cash in his hand he’d go off to one of the near-by off licences. “Talking to Isherwood, I was impressed by his amazing knowledge in the world of art. He’d sometimes look at paintings in the shop and even explain them to me. He knew his stuff. “Once I went to his house and noticed piles and piles of unopened letters behind the door and in piles in the hallway. It was an amazing place where total artistic chaos ruled. “One story was that he was taken to Wigan Infirmary collapsed after a long drinking session and while he was having his stomach pumped out, one of the nurses got to work cutting his long hair. It sounds unlikely enough to be true. “I’m glad I knew Jim Isherwood – a true artist and a real character. His work, like the man, is unique.